Invoicing with Forecast is easier with Xero. With the Xero integration you can now send invoices through Forecast directly to Xero. Synchronize your billable hours, based on clients and rate cards, create invoices in Xero, and bill your client in a matter of a few minutes. The Xero integration makes it even easier for depsoit invoices for upfront payments. Once activated, we automatically add a new Xero tab to all of your projects. This is where you create and manage your invoices. 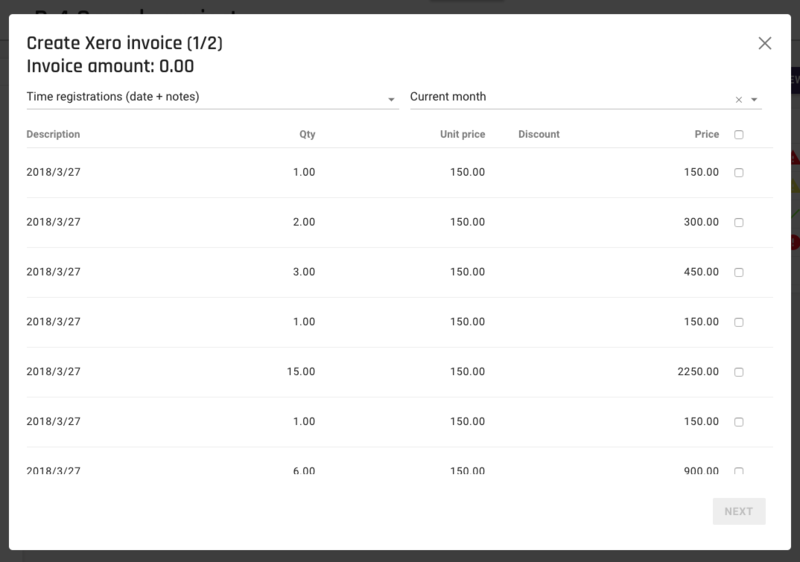 You can view details of previously created invoices or click an active item to go directly to the invoice in Xero. Please note, the integration does not work on Connected Projects. This is an example of the overview you get when navigating to the Xero tab. We have four types of alert symbols as you can see from the image above. Note: Xero requires that you go through them to make any actions in your Xero account, but we made it as easy as possible. To update information between Xero and Forecast, click the Synchronize button in your Xero tab. You must have a Xero permissions level of Standard and up to Synchronize with Forecast. Deposit invoicing, i.e. upfront payments allow your client to pay a portion of your invoice and you receive the remaining balance later. With this integration the deposit can also be done as a percentage or fixed amount. You can send out invoices to your clients based on your Scoping/Forecasted Price, or account for Time & Materials. Step 1: Go to the Xero integration, click here. At the top left of the window, you can select what should be billed on the invoice, e.g. time registrations, card titles, roles, or milestones. So, here you decide what your client sees on the bill. At the top right of the window, you can sort the list by current month, dates, etc. You can even give discounts on specific items by typing a percentage into the Discount field, and it will automatically be subtracted on your final invoice. Step 8: At the right, check the checkboxes for the items you wish to send to the invoice in Xero. You can also check all of them at the top. Step 10: Enter Xero information, i.e. invoice reference, invoice client, invoice account, and invoice due date. You'll now be sent to Xero to review the invoice draft. Continue as you normally would, approve the invoice, register received payment, etc. Remember, to update information in your Xero tab, you need to click the Synchronize Existing Invoices button, and approve the action on the following page in Xero.